Welcome to the maiden voyage of First to Fight featuring All-Marine Wrestling head coach Jason Loukides. 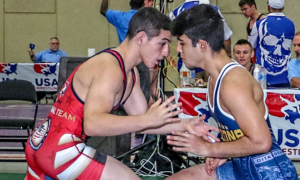 As is the case with our other coaches’ reports, First to Fight is an opportunity to glean direct insights from a USA Senior Greco-Roman head coach pertaining to his program– including recent event results, athlete performances, and upcoming plans. It’s likely not a great mystery as to what will serve as the lead topic for this first report with Coach Loukides. 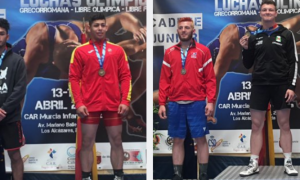 The 2019 Dave Schultz Memorial International wrapped up last week in Colorado Springs, and when it was all said and done, two Marine Corps athletes came away with titles. At 67 kilograms, Jamel Johnson reigned supreme, defeating Mostafa Mohamed (EGY) in the final; and one weight class up it was Ray Bunker, who got past Asror Mukhitdinov (UZB). 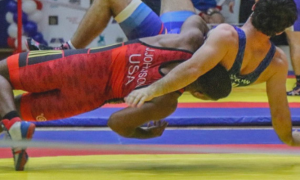 One interesting sidebar: both Johnson and Bunker not only won their first Schultz golds, but they were also the only two Americans to have vanquished foreign opponents in their respective finals. 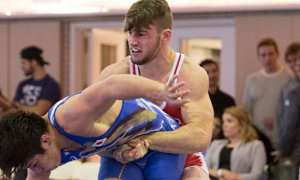 Following up the Schultz talk is Loukides’ perspective on an impending trip to Croatia for several of his charges, and what he’ll be looking for out of their performances. To close up, the coach offers his philosophy on the training plan now that the annual Armed Forces Championships are mere weeks away. 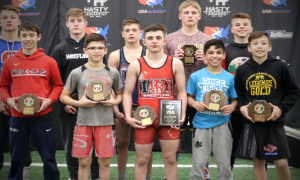 5PM: The Marines’ current National Team members (Daniel Miller, John Stefanowicz, Xavier Johnson, and Peyton Walsh) did not compete at the Dave Schultz tournament. Why not? 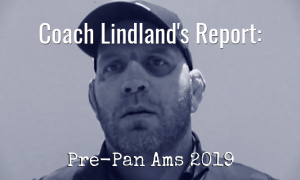 Coach Jason Loukides: After talking with Coach (Matt) Lindland, he wanted the guys to go to the ranking tournament in Croatia. And so we thought with them being able to go out to Colorado Springs and work with Mohamed (Abdelfatah) and Matt, they could focus more on pushing themselves for that one, rather than trying to squeeze in the Schultz. 5PM: Can you provide an update on Colton Rasche? He defaulted out of the event seemingly due to injury. JL: Yeah, we were just a little worried about his ribs from the situation where he stepped over on (Travis) Rice. I’m just over-cautious with a month to go before Armed Forces and I want to make sure he’s healthy. Both he and Terrence (Zaleski) were pulled when they might not have needed to be pulled, but I was just being extra cautious with Armed Forces coming up. 5PM: You had two champs and we’ll go in weight class order. Jamel Johnson, who has been an exceptional wrestler throughout his career, won his first Schultz title. This was the tournament last year that marked his return and he took third at 72. Other than that brief hiatus for school last winter, he’s become steady again. What does a win like that do for him right now? JL: Well, I think for him it was big for him to get over the hump and actually win. He had won the New York AC (Athletic Club) and he won a lot at age-group, but it had been kind of a while. He has been medaling but not winning. So for him to break through and win — and we obviously know Mostafa is a quality opponent — just the process of winning takes that barrier away from him. I think it’ll help him in the future focus on winning the tournaments instead of on medaling, and not seeing that as a huge difference. I think it’ll help him a lot getting over that hump moving forward. 5PM: You know Jamel really well personally, so when you say “get over the hump”, it’s as if he needed to see he could do that? Is that the difference-maker, for him to at least see or remind himself that he could do it? 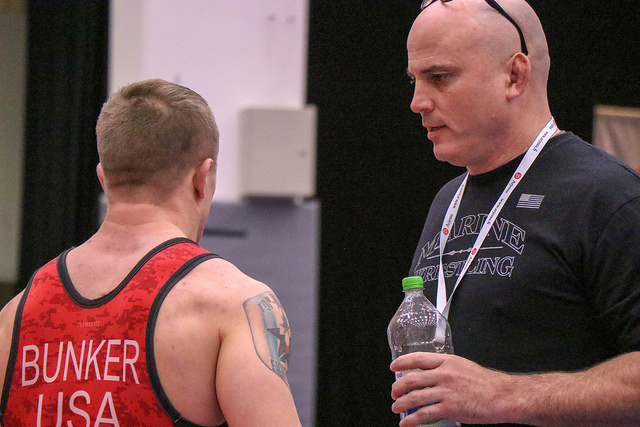 Coach Jason Loukides: For me, it’s just, you start making that too significant. You know you can beat the kind of guys who are winning the tournament, but even if you’re in the finals you have to battle. It’s one thing to break through and win, and just focus on your wrestling. He wants to win the tournament so bad that I think if you watch the match closely you could see him fatiguing — and that’s a mental fatigue, not a physical one. He wants to win so bad that he’s holding on and squeezing. I think just knowing that there’s no difference between beating those guys in the semis and the finals will allow him to relax more next time he’s in the finals, and he can focus just on the wrestling. 5PM: It used to be that Ray Bunker got credit for his determination and constant improvement. 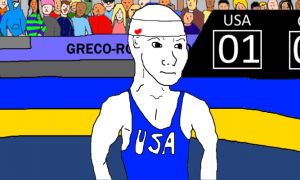 You turn around, and he’s now won the last two international tournaments we’ve held in this country, and on top of that, he’s getting medals overseas, too. He’s in the process of becoming a top guy. What did you say to him after this win? JL: I mean, he believes, I believe. He’s excited because he had been saying all month that he was going to win this tournament. So it’s not as big of a surprise obviously, we know that with his style and the amount of pressure he can put on people that he’s hard to beat. If you get behind on points to him and you’re not able to get a passivity, he is going to be a challenge for anyone around those weights to beat. We’re just excited that he’s staying with his style. Watching his matches, I knew he had a lot more to give. If he was behind, he could have brought a whole lot more heat and whole lot more pressure. But he never got behind, so he stayed more conservative. We’re just excited. We’ve believed in him for a long time and he definitely believes in himself. He likes doing it with Jamel. 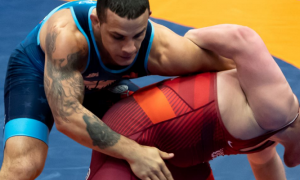 They like to win together and go different weights, compared to last time (at the World Team Trials) when he lost two matches and they were both to Jamel (laughs). It’s nice for it to work out that way. Sometimes, when you have a close team it’s hard to wrestle each other. It’s almost like you’re doing something wrong. 5PM: Miller, Stefanowicz, Walsh, and Johnson are all going to Zagreb for the tournament. For these guys right now and where they’re at in their respective weight classes, they’ve all essentially “arrived” at this stage, do you put a lot of stock in how they do at the actual tournament? It’s always “the camp, the camp, the camp”, but for this time out, will you hone in on how they perform? JL: At this point in the year, we look at it like a test. Like an exam, a final exam we can evaluate. The thing I was most interested in is that it’s a “Ranking Series” tournament, so I know there are going to be a lot of good guys there. It’s a chance to really challenge themselves and compete against these guys. What I’d really like is for them go over there and come home ranked in the world after this tournament. That’s really good for the US and it’s obviously good for our program. That’s what we’re looking to do. It’s not like I put a lot into it in terms of pressure, I’d just like to see us have a quality tournament, send the guys, and see where we’re at. See if they can get in there and win one of those tournaments and get more US guys in the rankings. It would build everybody’s confidence and then we can start doing it at the World Championships and Olympics. 5PM: Considering that you yourself competed at the World Championships and now you’re the head coach of a program, do you like the format of the “Ranking Series”, how events are weighted with point values and potentially lead to seeding? JL: I don’t know what they are going to eventually do with them. I think it’s kind of in limbo now, where a guy can get a bunch of points and then not go to Worlds. It almost messes up the seeding as much as a blind draw would, so I don’t know about that. What I know is that with these tournaments now, we know where we can go, and if we do well, we can get ranked. So I like that part of it (laughs). If we go to those tournaments and place high, we’re wrestling good guys and we are going to be ranked in the World. That will start making more people look at us. 5PM: With Armed Forces now right around the corner — and with that event holding so much importance to the service branches — do you do conduct practice any differently in the weeks leading up to it? Coach Jason Loukides: Not really. With any competition, there’s always the balance between people getting hurt, and people getting the training effect from it. You can’t fear it, otherwise you end up doing absolutely nothing (laughs), so you have to obviously get in there and watch a little more. You make sure the guys aren’t doing too much if they’re sick. Just like pulling those guys from the tournament — they wanted to wrestle and I probably would have let them if we didn’t have Armed Forces coming up. You balance that, but you still know that there is a certain amount of work that needs to get accomplished this month before the taper, and you obviously want everybody healthy. It’s a balance. We make sure they don’t do too much. If they had duty or something like that, they’re not coming in with no sleep going hard. Just anything we can do to minimize possible injuries because that affects us the most. If you can’t field a full team, you’re going to be hurting. Follow the All-Marine Wrestling Team on Facebook, Twitter, and Instagram for updates on results and competitive schedules.